Stonehenge is a pre-historic monument in County Wiltshire in Southwestern England. The famous ring of stones, estimated to be 4-5,000 years old, is one of the most recognized and important cultural sites in the United Kingdom. While there continues to be debate about the function and purpose of Stonehenge, there is no debate that it looks amazing from the air. Contributor Mikee1554 does so beautifully in this stunning video, created with a DJI Phantom drone. 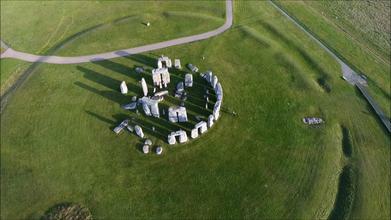 Description: Stonehenge is perhaps the world’s most famous prehistoric monument. It was built in several stages: the first monument was an early henge monument, built about 5,000 years ago, and the unique stone circle was erected in the late Neolithic period about 2500 BC. In the early Bronze Age many burial mounds were built nearby. Today, along with Avebury, it forms the heart of a World Heritage Site, with a unique concentration of prehistoric monuments.